Many people use the term "waterbugs" to describe large cockroaches found in wet areas indoors, but this isn't accurate terminology. Cockroaches and true waterbugs, which include water boatmen and water scorpions, are completely different insects. They look similar at first, but upon closer inspection, it's easy to tell the difference. Plus, it's unlikely you'll see a true waterbug in your home, so what just crawled over your foot most likely is a cockroach. Cockroaches have flat, oval-shaped bodies with two long antennae and six legs. The small head is indistinguishable from a cockroach's body when seen from above, but you can spot short spines along each leg. Cockroaches range from 1/2 inch to about 2 inches in length. 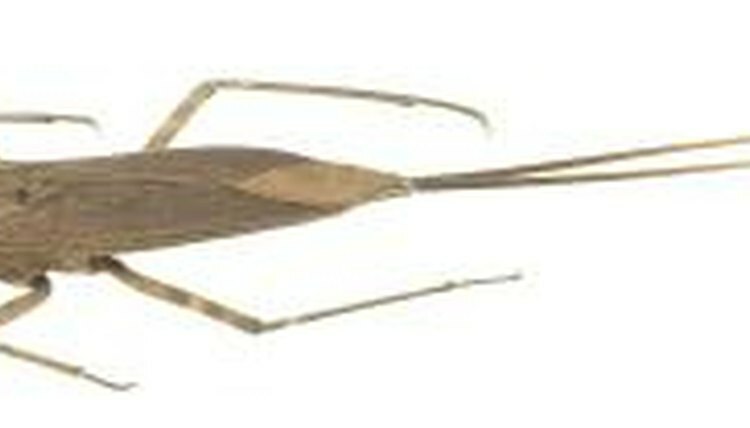 Water boatmen stay about 3/4-inch long and share a body shape similar to cockroaches. However, their front legs are thicker with flat back legs used for paddling through the water. Water scorpions stick with the oblong, flat bodies, but they have a long tail used as a siphon and front legs that resemble those of land scorpions, although they lack actual pincers. Their bodies grow to about 1 1/4 inches long, but the siphon brings their total lengths to 2 1/2 inches. A variety of cockroach colors exist, depending on the species, including light or dark brown, tan, reddish brown and black. Some roaches have darker bands that develop horizontally across their bodies. Waterbugs tend to be dark brown, often with a mottled look that helps camouflage them in their aquatic environments. Where you find the bug in question helps you decide whether it's a cockroach or a true waterbug. Cockroaches commonly come inside homes, although most live outside. German cockroaches prefer damp environments, such as bathrooms or kitchens, while brown banded cockroaches like it warm and dry, such as under your refrigerator. Oriental cockroaches are the ones most likely to be called waterbugs; they like dark, cool, damp places, such as basements, but they can be found in bathrooms, kitchens and sewer drains. These typically are larger than the 1/2-inch German and brown banded cockroaches, topping out at 1 1/4 inches. The American cockroach prefers hot, moist areas, such as professional kitchens. Waterbugs, however, live in aquatic environments, such as marshes and lakes. They live in the water, swimming under and on the surface seeking prey. They rarely venture away from their chosen habitats. Because waterbugs typically aren't a problem in your home, focus on eliminating cockroaches if you've seen flat, oval insects running along your baseboards or counters. Cockroaches can spread bacteria and disease, so it's essential to eliminate the problem quickly. Put all uneaten food away in closed containers, wipe the crumbs from your table and floor immediately, and don't leave dirty dishes out overnight. Spray cracks and crevices with insecticides, such as those containing permethrin or deltamethrin, or choose a more natural insecticide, such as boric acid. Call a professional exterminator if necessary to rid your home of cockroaches.